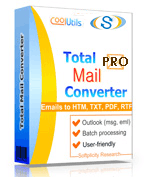 Total Mail Converter Pro X converts MSG and EML to PDF, DOC, RTF, TXT, HTML, XHTML, TIFF, RTF documents and TIFF; JPEG images on your Windows web-servers. This powerful utility allows you to convert emails as well as their accompanying attachments. Designed for use online, the server version has no graphic user interface, so it runs silently behind the scenes providing users with an uninterrupted work flow. Attachments saved as DOC, TXT, RTF, PDF, HTML, XLS, PPT formats are quickly and easily converted to DOC, RTF, TXT, HTML, HTMLX, JPEG, TIFF, PDF. Attachments can be inserted as clickable links into converted emails. Working with multi-page formats, you can combine several emails into a single PDF, DOC or TIFF file. Enhance and index important emails by stamping bates to your messages and attachments. Includes ActiveX so that you can easily integrate the converter into your web-server build. Includes code examples (PHP, C++, ASP) for you to implement into your web-server build. 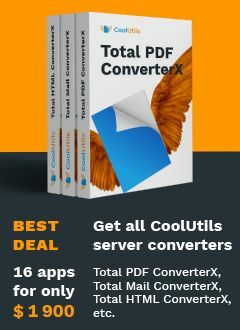 The Total Mail Converter Pro X is a unique server-based email converter that's second to none when it comes to providing users with flexibility and beneficial options. No other program is capable of working with so many different types of attachments. You are welcome to test the full version for 30 days without any obligation. Try it today by downloading our free trial version! "We are very happy with the Total Mail Converter. We used it to convert around 20 thousand mails to PDF, important for us was it's ability to convert mail attachments into the target PDF. On converting the 20 thousand mail, only around a dozen of them failed because of unreadable attachments." "So here is our only suggestion for improvement: Once the conversion of a single attachment fails, don't skip the whole mail file but rather convert the other attachments and complete the PDF without the single faulty attachment. Keep up the good work." Provides access via ActiveX interface for all legacy programming languages (Visual Basic 6 or Delphi) as well as scripting (i.e. VBscript). Any language that supports Web Services including .NET (2.00, 3.5, 4.00), Ruby, PHP and Java is supported. Emails to PDF, DOC, TXT, HTML, HTMLX, TIFF, RTF, TIFF, JPEG.